The cheetah (Acinonyx jubatus), also known as the hunting leopard, is a big cat that occurs mainly in eastern and southern Africa and a few parts of Iran. The only extant member of the genus Acinonyx, the cheetah was first described by Johann Christian Daniel von Schreber in 1775. The cheetah is characterised by a slender body, deep chest, spotted coat, a small rounded head, black tear-like streaks on the face, long thin legs and a long spotted tail. Its lightly built, slender form is in sharp contrast with the robust build of the other big cats. The cheetah reaches nearly 70 to 90 cm (28 to 35 in) at the shoulder, and weighs 21–72 kg (46–159 lb). Though taller than the leopard, it is notably smaller than the lion. Basically yellowish tan or rufous to greyish white, the coat is uniformly covered with nearly 2,000 solid black spots. Cheetah are active mainly during the day, with hunting its major activity. Adult males are sociable despite their territoriality, forming groups called “coalitions”. Females are not territorial; they may be solitary or live with their offspring in home ranges. Carnivores, cheetah mainly prey upon antelopes and gazelles. They will stalk their prey to within 100–300 meters (330–980 ft), charge towards it and kill it by tripping it during the chase and biting its throat to suffocate it to death. The cheetah’s body is specialized for speed; it is the fastest land animal. 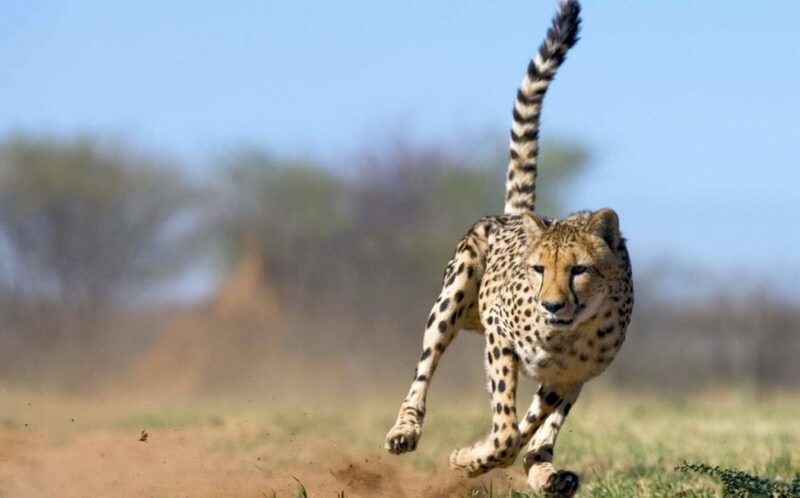 The speed of a hunting cheetah averages 64 km/h (40 mph) during a sprint; the chase is interspersed with a few short bursts of speed, when the animal can clock 112 km/h (70 mph).